So, I know that many of you like gerbil posts. Unfortunately, the gerblets have grown up and now look just like every other gerbil in the world. I tried to get them to smoke cigarettes to stunt their growth so they’d stay small and adrable, but they don’t have opposable thumbs, so they kept dropping them. They totally looked cooler while they did it though. I do still have many photos. The boy gerbils have a whole bunch of houses in their tank, but they like to sleep in a pile in a corner where I can laugh at them and take photos. I actually think it’s kind of lovely that they snuggle like that. Although I can’t imagine that it’s super fun to be on the bottom there, like King is. They also like to prank me. Mouse plays dead really well. You should also know that Quinn has been looking out for you gerbil lovers out there. 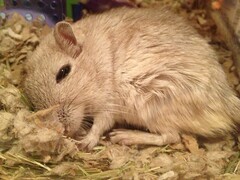 He regularly disappears with my iPhone only to return with blurry photos of gerbils—and sometimes video. He took the following video the other day and insisted that I put it on the internet. In his defense, I think he might be right about its internet worth. 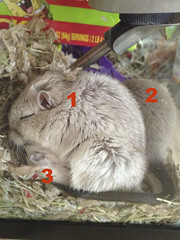 My gerbils continue to use their exercise wheels all wrong, but in all kinds of different and interesting ways. See how Spike (or Jefferie—it’s hard to tell) does it. Also, based on suggested videos that appear after this one plays on YouTube, there are a tremendous number of people taping their gerbils running on horizontal wheels. A lot of those people even have better camera skills than Quinn. I’m going to go feed and give cardboard tubes to the little furballs now. I hope you’ve enjoyed today’s gerbil interlude.